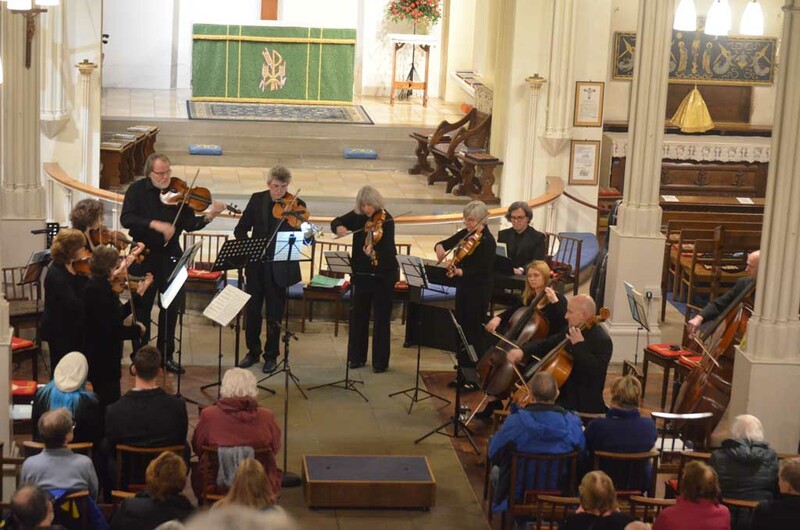 Thank goodness Arco Strings come to SMSG to perform to brighten up a dull January evening. 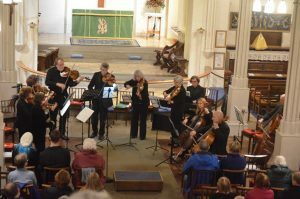 In this, their third annual concert in Stony Stratford, the programming gave us a string sound that was at times symphonic and in places full of delicacy and grace, but always controlled and with rhythmic drive. From the opening work, Biber’s 1673 work Battalia a 10, directed by Arco’s leader Celia Waterhouse, the ensemble told us to expect every possible technique the strings could offer (including a piece of paper tucked into the double bass’ strings, snaps of strings onto the wood of ’cellos to create gunshot effects, and eight separate folk songs played simultaneously in separate musical keys). The movements of Biber’s music represent soldiers preparing to do battle, the battle itself and a lament for the dead. David Knight introduced and conducted the remainder of the large-scale concert with authority and great musical awareness. 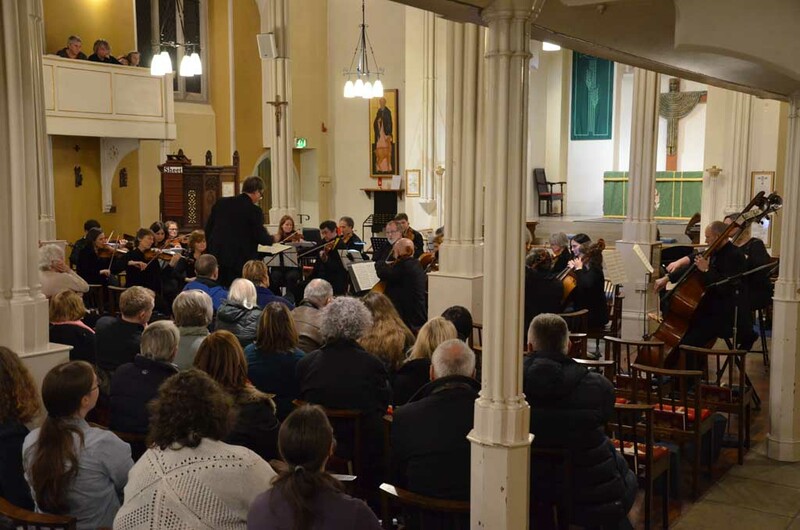 Stravinsky’s Concerto in D, with its classical allusions led on to the Colombian Suite by Arco Strings’ Patron Arturo Cuéllar, a major work based on the composer’s preferred fusion of Colombian dance rhythms with strident harmonies. The energy of the performance drew the audience into the unfamiliar sound world, and left us all delighted. More thrilling sounds were to come. The entire second half was given over to Tchaikovsky’s Souvenir de Florence. It’s more of a symphony for strings, such is the complexity and denseness of the writing, yet it saw its origins as a string sextet. 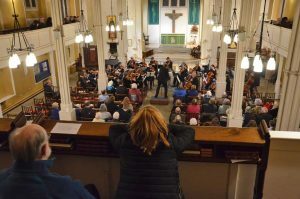 The detailed attention David Knight brought out from the ensemble, driving the music inexorably forward, demanded intense concentration from players and audience alike. The lyrical second movement had wonderful passages of great beauty, none more so than the first ’cello part, exquisitely phrased and pitch perfect. 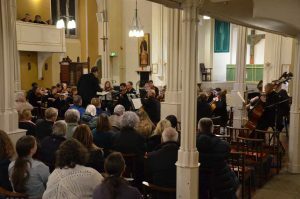 The finale was a bravura movement, at a cracking tempo, with a triumphant close to finish a terrific concert. Players and conductor should be proud of the huge enjoyment they gave us all: they certainly looked as though they too were having fun. We can’t wait for next year’s concert. For more photos see the Arco Strings album.